This idea started at Pickle Me This, then I saw it on Reading in Bed and Bookish Beck. If I’m missing someone, let me know in the comments! Reading in Winter (who has read an impressive number of books this year!) has also participated. I’d love to hear where your books come from, too. Join in! You can either list the last 30 books you read, or calculate your stats for the whole year. Or both. It’s no surprise to me that a little over half of the books I read come from the library. Even though I have enough books of my own to last for years. But libraries are irresistible! So, where do your books come from? 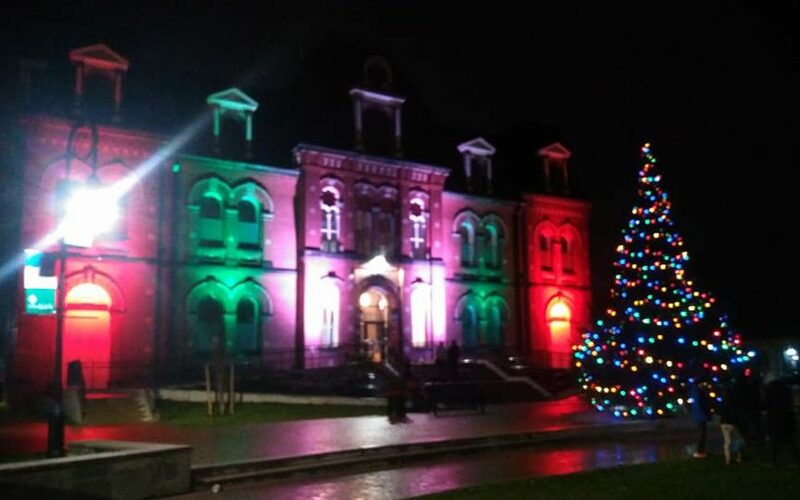 Our library all lit up for the holidays. A very happy holiday to you, too, Naomi. Hope you manage some reading time! Good for you, using your library (which looks very sweet with the lights). Happy holidays! You are a library power user!! My list would take 30 seconds. Haha! Well, that does make it easy. I’d love to see your shelves of shiny new books. Do you keep them all? Happy holidays! Great library use. I broke mine down on Bookish Beck’s post and it came down to mainly gifts and second-hand shops! Second-hand shops are the best! Most of the books I own are from second-hand shops and book sales. Nearly all mine come from charity bookshops. But next year I plan to follow your fine example and use the library much more. Happy Christmas Naomi! Charity book shops are also wonderful – most of the books I own are from used book stores or book sales. I just never get to them because I’m too busy reading library books! Sigh. Either free books from indie authors, some publishing companies or charity shop runs 😀 Great post. I request most of my books from the main library and then pick them up at the neighbourhood library. However, with my husband sick this fall, I found my system didn’t work too well…I relied on borrowing from friends. I buy some books because I have a son and a granddaughter in the writing business and I know that is not the easiest way to earn a living. We need to support our writers! Happy Christmas and or holiday to all…..especially to you Naomi….I will look forward to your January blog. Thank you Jessie! And thanks for commenting. You’re right… we need to support our writers one way or another! Happy Christmas! Fun tag! I suspect mine are mostly NetGalley but I must do a count. Have a lovely Christmas and a Happy New Year when it comes. Lang may yer lum reek, as we say here in Scotland! Haha! That’s certainly a good way to go about it. I don’t know if I could do it… I guess working at one doesn’t help. But it’s worth it! That’s a good mix of bought and borrowed. I did this too https://www.exurbanis.com/archives/12124 and found that library books formed 60% of my recent reading. I don’t even have to go anywhere near my library for that to happen- the online catalogue and reservation system is just TOO convenient! Did you have fun making your calculations? This year would probably not be very representative of my habits overall, as I have been devoted to refusing offered copies and devoted to reading more backlisted books from my own shelves instead. 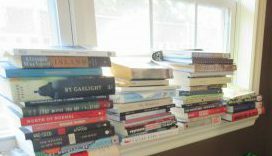 Even so, I suspect my library use is still very high, because some of my reading projects depended almost entirely on selections which weren’t on my shelves (like my Louise Erdrich reading). I think looking at the data for one’s books and reading habits is really useful; it’s such a quick way to see if one wants to make any shifts in decision-making (which is why I ended up reading almost exclusively my own picks this year and older books overall – the data dragged me into it!). Not to say that one needs to be thinking along those lines – that’s just how it works for me! Enjoy your holidays and I hope they are just lovely! I *did* have fun! I love looking at reading stats (my own or others) – I find it all so interesting. This was one I had never calculated before, and although I suspected a high library percentage, it was still fun to figure it out more accurately. Now I’ll be tempted to do it every year to see if it changes! I have to say you have a very balanced way of obtaining your books, so you should feel good about that. You’re literally the perfect reader and book buyer! Also, your library is gorgeous all lit up like that! I love your library’s lights! I did a quick calculation of my latest 30 reads (a few weeks ago) and it was something like 26 from the library, 2 bought new, and 2 bought used. That’s pretty representative of my reading! 🙂 Merry Christmas and Happy New Year! Any book I review on my blog has either been borrowed from the library or purchased. Thanks for chiming in, Don! That’s so great that you make good use of your library. Checking out a book keeps it in circulation. If it sits on the shelf too long, it gets removed. Plus, authors appreciate it (I’ve only met one who did not). Now I have to ask… did the author say why he/she didn’t appreciate it? She was saying that she wouldn’t get paid at all for the library copy. But…the library has to buy a copy, right? So, maybe she gets paid once? I was surprised she was so mad initially (she softened up later) because she’s a small-press author, someone should have known going into things that she wouldn’t make any significant money as a writer. If she wanted to make more money, she would have had to go with a “big” small press or a NYC press. One big advantage of libraries buying the author’s book is the exposure to new readers the author might get because of it. I agree; there are lots of reasons libraries are the way to go. I wonder if this author I mentioned doesn’t have a lot of money and struggles. It’s also unfair that some authors get to sit around writing all day because he landed the right book deal. I’ve heard that there are many artistic grants in Canada that people make use of to produce art and books! Sheila Heti comes to mind. Have you heard of her? She’s in Toronto. I loved her when her first book came out…since then she’s gone a bit Lena Dunham, of whom I am not a fan. I haven’t read anything by Sheila Heti, or know much about her writing career. But we do have grants for artists here, and a lot of literary awards. Even the small ones can help make a difference. I just assumed everyone else had them, too, but maybe not! Nope. We constantly have to defend public radio and TV, which costs almost nothing of the American budget. Glad to hear it! It’s hard to find that perfect balance between new books and old, isn’t it? What a fantastic idea! I mostly get review copies of the books that I would like to read, though my beloved ones do contribute a lot, and I am a firm believer on using public libraries as a way of making a political and cultural statement. Happy New Year to you too, Naomi! Just like you most of my reads were from the library (15). Three were brand-new purchases and three more were second-hand. Two reads were books relative lent me. One book was from the publisher and one from Netgalley. I’m hoping to go back to my usual (reading) self this year! I still haven’t gotten around to my 2017 posts. I’ll do one in the next few weeks hopefully. I don’t know about the last 30 books I got but I do know that of the books I read in 2017: 16 (27%) were library books, 15 (23%) I’d previously purchased/received, and 18 (30%) were from publishers of some sort. Not too bad of a mix although I need that publisher number to go down so I can clear of my TBR shelves! A good mix! But I hear you about that tbr… the library is my tbr’s biggest competition. Mine too so far this year!